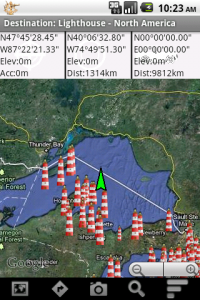 Destination: Lighthouse – North America is now upgraded to be Android v4 compatible. Along with a few minor bug fixes, there’s a new, clearer user interface and support for some of the newer devices which don’t have physical buttons. Get it now at Android Market. If you’ve run out to buy your (not yet released) Android 4 phone, don’t worry. I’m updating all the apps to work on Android 4. Hopefully won’t take too long. Might even be done before you can actually even buy one. It’s warm and sunny throughout much of North America this weekend, maybe our last warm, sunny weekend of the year in much of the US and Canada. Fall colors are starting to peak throughout much of the area, too. If you’re only going to go outside one more weekend this year, do it this weekend. While you’re out enjoying the weather, if you’re on the Atlantic or Pacific coasts, or near any of the Great Lakes, grab a copy of Destination: Lighthouse – North America. Lighthouses are at their peak with fall colors and blue skies. Destination: Lighthouse – North America – now available! Destination: Lighthouse – North America has just been released. With 2,330 lighthouses, sound sources, and RACONs, it’s just in time for your fall color tours! 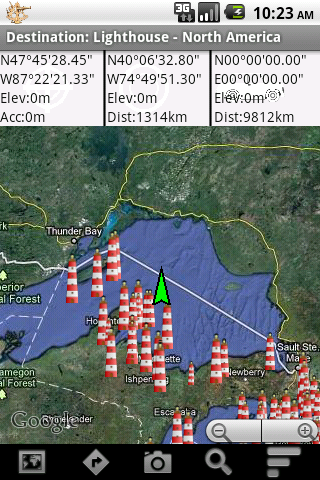 Our first Destination app, Destination: Lighthouse – North America is available for $1.99US from Android Market. And don’t forget to check out our always-free local park apps for your Android. Destination: Lighthouse – North America is ready to go. Unfortunately, it’s not available for another day or two due to a government delay, while I wait for the required sales tax license. It should definitely be out for this weekend, though, in plenty of time for your fall color tour.